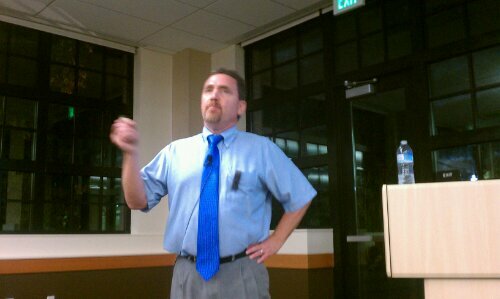 Dr. Ben Santer speaks on climate modeling, and everything else | Watts Up With That? First I’d like to say that no, he didn’t try to make good on the famous Climategate email line about Pat Michaels. Both he and the host, Jim Pushnik were quite gracious, with both of them talking to me personally. I was prepared to stand up and argue the use of the word “denier” should Dr. Santer have used it, fortunately he did not. I was surprised that Dr. Santer recognized me when I asked a question (I talked with him afterwards), unfortunately, I didn’t phrase the question well enough, and I should have brought a printout of the graph I was thinking of with me. More here. Here’s the program, video follows. Please join us October 20th for an important climate event! Cost: Free and open to the public, seating may be limited. Climate scientist Ben Santer is a member of the National Academy of Sciences (NAS), shared in the Nobel Prize awarded to the IPCC and has received a Distinguished Fellowship from the American Geophysical Union, and MacArthur Genius Fellowship for his research on human‐induced climate change (read full story). Dr. Benjamin Santer is currently a atmospheric scientist at Lawrence Livermore National Laboratory (LLNL). His research focuses on such topics as climate model evaluation, the use of statistical methods in climate science, and identification of natural and anthropogenic “fingerprints” in observed climate records. Dr. Santer’s early research on the climatic effects of combined changes in greenhouse gases (GHGs) and sulfate aerosols contributed to the historic “discernible human influence” conclusion of the 1995 Report by the Intergovernmental Panel on Climate Change (IPCC). Santer, is considered an expert in the climate change research community, has worked in the Laboratory’s Program for Climate Model Diagnosis and Inter-comparison (PCMDI) for nearly 20 years, and is a frequent contributor to congressional hearings on the science of climate change. He credits his success to the exceptional scientists he collaborates with at LLNL. Presented by The Institute for Sustainable Development, the Rawlins Endowed Professorship for Environmental Literacy, and the Gateway Science Museum. Part 2 – only 3 minutes of Q&A and then my battery died, there was about 5 minutes of questions after that. The Lawrence Livermore National Laboratories? If I remember correctly, back in the 80’s they were the backbone of the USA effort, led by President Reagan, to develop the “Strategic Defence Initiative” (a.k.a. the “Star Wars”). They were working hard to develop laser beam guns, A-bomb activated neutron beam weapons, and other stunny weaponry devoted to fight (and perhaps to win…) WW III against the former Soviet Union. In the same manner, a lot of people at NASA (born as NACA, we should remember…), was working for the US military (any aviation entusiast knows that most US combat aircraft (F14 Tomcat, F16 Viper) have been developed, at least in the early stages of their R&D history, in the NASA laboratories). I also remember a statement from the ancient Roman Emperor Tito Flavio Vespasiano, after issueing a “tax” on public toilets (after that, the Romans had to give a coin to use them): he put a coin under the nose of a senator that was “skeptical” about the new “tax”, and he simply stated: “non olet” (in latin: “it DOES’NT smells”). After that “tax”, here in Italy public toilets are also referred to as “vespasiani”…. When it is all said and done, it is this man who will go down in history as the most important actor at a pivotal moment in the history of the whole extraordinary story in the history of science. December 1995. IPCC SAR Ch 8. Ben Santer. Study him well. He is the man. ” … identification of natural and anthropogenic “fingerprints” in observed climate records”. To save having to listen to all his nonsense, in brief, what does he claim man’s elusive “fingerprint” on climate to be ? What kind of argumentation is that! He wasn’t lying when he said that answer “came from the seat of his pants”. What Santer and his group have done is that they took the murder weapon, wiped off all the fingerprints, asked CO2 to hold it for a minute, and now insist CO2 committed the murder because its fingerprints are on the only ones they can see on the weapon. It amazes me how the sun drove the climate on earth for 4.5 billion years, and now they expect us to believe that it stopped 100 years ago and that everything has since been taken over by man-made CO2. Puny muons can’t change the system, by puny CO2 does it all? Unfortunately I do not have the luxury of having 90 minutes to waste watching Santer spill from the seat of his pants. Dr Santer is obviously a man of great intellect and, I have no doubt, integrity, but he seems to have had his “Great Idea” when he was young and now spends his life trying to protect the Plinth that his statue will eventually stand on. Anthony: thanks for this and the many other excellent posts of late. It certainly has been a busy day and I don’t know how you get so much done. Particularly when your patience must be tried by incompetence (or worse) on the part of others. The shenanigans of the BEST people being only one example. Keep up the good work, please! 1. The temperature index since about 1800 produced by CRU is broadly similar to that produced by a group of independent evaluators. 2. According to those evaluators, rises in temperature in urban areas are mimicked by those in rural ones. 3. There has been a rise of about 1 degree Celsius since 1940. Based on the story there, there is no discussion whatsoever about what caused the temperature modulations. Nothing to do with carbon dioxide at all. Nothing. What is also clear is that the records being discussed are only since the Little Ice Age. There is no discussion about the climate optimum which preceded the Little Ice Age. 1. It’s a good idea for multiple independent verifications to take place. 2. It’s a good idea for objections to be examined thoroughly, scientifically and objectively. 3. It’s also advisable to suggest that you don’t have to question the temperature record to question the cause of the change. The implication of the story is that ‘deniers’ claim that the temperature records are definitely wrong,rather than skeptics implying that the reasons for temperature oscillation may not be driven by carbon dioxide. 4. It is good to circulate results widely prior to publication to allow thorough discussion in the scientific community of results prior to publication. I still await a satisfactory explanation from CRU as to how the Romans could possibly grow grapes in Lincolnshire if carbon dioxide levels are the sole driver of temperature. They quite clearly aren’t unless all the data over one hundred thousand year studies correlating temperature and carbon dioxide are wrong. I’d also like scientists to start discussing the relationships between oceanic SSTs, land-based SSTs and stratospheric/atmospheric temperature. Because land temperatures are but one subset of the whole, yet they have produced this frenzy of the past 20 years wholly discrediting the scientific method in the process. Climate science is still in the understand phase, yet what we have are a bunch of primary school children preaching the Word of God. A little humility, a little more caution and a lot more openness is what is required.,……. They all have the same kind of beard. Anthony, for whatever it’s worth, I hope I can ask you to have a little patience with any comments about volume – many of us have volume problems. I typically use a laptop with the volume at max, AND plug in a set of speakers because that’s slightly louder than the in-computer speakers, and STILL far too often streaming video volume is so low that it’s very difficult to hear, particularly any of the softer speaking that occurs. Not to mention that some folks out here also have hearing problems also. I gather laptops are rather notorious for low volume problems. Please don’t get me wrong – I’m not suggesting you transcribe etc… just trying to point out that there can be very legitimate issues with volume on the Internet all depending on one’s system and personal hearing issues. Shoot, I can watch the exact same video file on two different players (e.g., VLC vs. Quicktime or vs. GOM or vs Windows Media Player or vs. Realplayer), and on one barely be able to make out anything people are saying, but on the other be able to hear them fine – all with the exact same computer settings (usually max volume!). So there’s got to be issues even within the programs we use to listen to things that affects how well we can hear things, even with the volume at max level. Seems to argue strawmen and is boring. Do anyone think the sun is only cause temperature change? same as only cause. I think all people including 5 year olds have notice things like clouds, and basically the chaotic nature of weather and climate. And what is this nature vs Man thing. Isn’t human a natural creature? Doesn’t life have a “fingerprint” on climate. It’s silly, Life transformed Earth’s climate. And our atmosphere has .03% CO2 which around 3 trillion tonnes of CO2- and we suppose to believe 80% of it is from humans. I wouldn’t care if 100% was from humans, what I care about is wasting my time listening to an idiot. Oh dear, hear I go again, & I am sorry for this, but UNIPCC SPM reports, “we don’t know exactly how Element A (Sun), affects element B (Earth’s Climate), but we know for certain that it has been overpowered by Element C (manmade CO2)! Now that’s pure logic – NOT! Apparently a 1/10th of 1 percent change in TSI & a 6-8% change in UV/EUV in somehing that contains 99.9% of the mass of the Solar Sytem (the clue is in the name – it’s not called the Solar System for nothing), 332,290 times the mass of the Earth, doesn’t affect Earth’s Climate at all today (just the winter weather in the Northern Hemishpere according to The Wet Office – UK), although it has done for billions of years beforehand as they readily admit! Makes sense? I don’t fink so!!! I think our leader is grumpy today after being pretty near “used up”. How he carries the load he totes is a mystery to me, but that’s why he’s our leader in this battle against abject foolishness. We “weekend warriors” should all keep that in mind. Of AGW and Mastodons: Extinct. Going quietly into that dark night of extinction. “As a result, climate-change policy and carbon-emission controls are rapidly moving off the policy agenda. Benign neglect appears to be back in vogue. Let me see if I can help you out. He may have intellect, but if so it is of the type most focused on the methods of deceit and dishonesty. berniel, you may be right on that one, even if you didn’t mean to use the /SARC tag. It was an extraordinary moment indeed, one that too many have forgotten. He alone reversed the science of the time, concluding a discernible human fingerprint on climate, when the agreed expert opinion was the opposite. Presto! No evidence required. He’s the man alright. If you don’t really care what scientists think. Mods – I’m submitting twice, is something wrong with wordpress? This was an excellent presentation. The slides were clear and concise (great format, not too busy but powerful info presented). The speaker was a top-notch climate scientist in the field. More postings like this, please. Attend more events like this. It seems folks in attendance kept an open mind, and I hope everyone learned quite a bit. To those commenters that are refusing to watch it all, I beseech you all to clear your head of expectations and watch it. So, essentially, the logic is it has to be like so or everything falls apart. But the only thing that seem to be missing is that little evil overrated thing called proof. If he’s going to go on and on about something shouldn’t there be a point to the whole point? A tip? Isn’t there a digital knob on the digital cameras today to crank up the recording volume. It used to be you had to record at twice the volume to get somewhat good audio at normal listening levels. And did anyone ask him about the Power of Poop video? Just a simple thank you for your efforts. My days would be much emptier if I was unable to check your website for all of the interesting posts and commentary. 2. My best in-line skating partner, (for racing skating training) is severly “hearing impaired”. She has <10% and it's all in the 16 to 400 cps range. She lost her hearing during her teen-aged years. So she can speak, quite clearly. She lip reads extremely well. Yet, to really communicate there are a variety of "factors" one has to be careful with. She could NEVER come close to what you still can do with a "live speaker". But dealing with the protocols of communication inherent with her loss, I think I have a "clue" as to what you struggle with. I want everyone to know that in NOT retreating to a corner, and dealing with just friends and family, you have more "guts" in your little finger, than I think I've got in my whole body. Feel free to grouse a bit. Doesn't bother me! Thanks for attending this presentation. I wouldn't have the time nor patience, despite my (alleged, sometimes I wonder!) normal hearing. Your efforts are greatly appreciated. That's something I wouldn't deny. Thank you for all of your efforts. Your extraordinary efforts have illuminated many here. The presentation of this video of Dr. Santer is very interesting in that he makes a very sharply shaped arguments to defend his positions. He seems to without exception avoid comparisons that would cast any doubt on his earlier pronouncement about human caused global warming. When I went to engineering school we were taught to present the results of an experiment and our conclusions. It was required to present the best arguments as to why those conclusions might be wrong. Quite often the apparent conclusion was overturned by the argument against the conclusion. In the video Dr. Santer slides between very short term time scales and then moves to long term conclusions. In general he speaks as a advocate not a scientist. The “we know” certainty is the revelation. If public figures wish to improve their communication ability to the public, they need to present their public forum argument with all the necessary accommodations the public needs in order to be informed. These regulations, especially related to hearing, are not only necessary for our aging society, it is just good business. Mr. Santer, take a consumer course in accommodations technology and then make sure your staff put these accommodations into place when you speak in a public forum. To not do so is bad form, bad form. Sound compressors (amplifiers that are automatically cranked up during silent phases and down during loud phases, reducing the dynamic) have been used since at least the early 70ies in the good old analog days, and much heavier than today, as the dynamic range of vinyl recordings was much smaller than todays CD’s and digital formats. It has also been used for ages for all kinds of broadcast media to compress the dynamic range of newsspeakers voices. The myth of the loudness wars was started by slashdot by somebody who complained about a mysteriously saturated Rush album; which was so maxed out that the spikes of the drums got cut off, as your video shows, and sounded sh*t.
Digital compression formats have nothing to do with it, encoding the amplitude is easy; the tricky part of a format like MP3 is encoding the audible frequencies in a space-efficient manner. Proof: It is possible to encode an opera just as well as a piece of radio pop music; and preserve the dynamic range of the classical music. Try it. It works. Anthony has my unconditional support here. People are asking far too much of volunteers. Great job- this is an important step in opening up a real debate, indeed in opening up an adult conversation. If skeptics want concerns addressed and questions answered we need inroads and healthy relationships… ultimately this is the way the rank and file of the warmists will be able to back down off the limb theyve put themselves on and get to a place where we can have sane conversations about resources and goals (of course the zealots and those too cozy with their money and power will never come around, but isolating them and exposing them for what they are is the best we can hope for). So this is the Santer who changed the “no discernable human influence” to discernable human influence, and had thousands of scientists asking for their names to be taken off the IPCC document! As for punching someone?looks like the only thing he’s punched is a hole a candy bag. The used car salesman in the video plays some nice logical tricks. Switched the Null Hypothesis, look Ma, no hands. Their attitude is “Gimme!”; didn’t you notice that by now. That’s why they play the game. There is a much more damning graph. It is the emissivity of CO2 from Leckner. And yes Mosh, this is based on solutions to the RTE’s. Rather than the logarithmic relation modelled by MODTRAN (an approximation of the HITRAN database, if I’m not mistaken), the relation from Leckner (a different approximation) appears more hyperbolic with the asymptote being nearly parallel to the x axis. The difference is the Leckner work covers higher levels of CO2 than MODTRAN. The Leckner work generates curves that are nearly identical to MODTRAN at atmospheric levels of CO2. This is of course obvious as they are approximate solutions to the same equations. Absorbance will continually rise as concentration increases, but the rate of rise is so low that it can be ignored for all levels of CO2 that are likely to occur in our atmosphere. If you were to plot the absorbance to black, one would need a different value than ppm of CO2 for the x axis, as the amount of CO2 that would be needed to cause absorptivity of 1 would be much much more than 100% of our atmosphere at 1 bar pressure at sea level. What we are watching here is the leverage of already decided politics (AGW) over sound and independent science. These politics contain control mechanisms which can unfortunately only be countered by political means backed by independent scientists. Therefore look for intelligent and open minded politicians. As you showed earlier with the brilliant expose covering the failed “Gore-CO2” experiment, if such results are only presented to “our crowd” of “sceptics”, we (reason) have failed. Of course, live recordings have their own issues, but, at least the better post-production editing s/w can equalize volume across the entire recording, all of which takes effort and time, the latter being a component in short supply on occasion. Nonetheless, thanks for the videos Anthony. It actually didn’t. Billions of years agot the Sun was 30% less bright than today, yet there was liquid water on our planet. Most researchers ascribe that to greenhouse gases having much higher concentration then than now. Anthony, thanks for the video. Somehow Santer sidesteps the data from 7 radiosonde/satellite data sets that show the lack of a hot spot at the top of the troposphere over the tropics. This lack of a hotspot means that either the surface temperature data set is wrong or the theory of greenhouse forcing of global temperatures is wrong. The simple truth is that there is no direct fact-based evidence that human activity has had or is having any detectable impact on global climate, leaving the AGW hypothesis as what it has always been, mere speculation. If such evidence existed we would doubtless all know about it. Well with 30% less sun, I would hazard a guess that there was likely only about half of the present 60 odd percent of global cloud cover, and that probably means a similar drop in total global atmospheric water content. Not much need to change any other GHGs. Couldn’t their be an alternate question? Why not look at some of the fingerprint evidence developed in Livermore Labs and other peer reviewed research? Dr. Santer explains in the video some detail concerning the fingerprints and other evidence that indicate CO2 is a driver. If the PDO were the sole driver, why would Dr. Santer have displayed a fairly strong stratosphere cooling effect (an indicator that heat is being trapped)? The PDO on its own wouldn’t display such a behavior, right? And I hope you don’t mean the remark that indicates many of the folks that accept the evidence for AGW are agenda driven. I mean, the National Academy of Sciences put out this statement (back in 2005 I believe). I would hope an institution with such a long history wouldn’t have an agenda. I invite all to read the statement, it is succinct and informative. A cooling stratosphere might have been an indicator that heat was being trapped in the troposphere by GHGs, but not necessarily so. In order for that to be the case, one would have to demonstrate that heat was indeed building up in the upper troposhere. All measurements show that this has not been happening. Therefore, there must be a mechanism other than ‘greenhouse’ warming that caused stratospheric cooling. I’d suggest looking up for the answer, but waaaaay beyond the troposphere. NO MYTH; some segments (notably commercials) can come in quite a bit LOUDER on some terrestrial DTV broadcasts. So much so, I am considering using the Line Out from the DTV receiver and running that through a compressor/limiter to resolve the problem (at least locally)! If there exists a statement on global warming by any organization, it in and of itself indicates that said organization has an agenda. You’re right about the commercials, but the video shown by Rational talks about the alleged trend to compress (or alternatively limit; cutting off peaks) music… and that’s really a myth. 16bit resolution on a CD was not invented to not be used. So would the Department of Defense have an agenda too? They seem to acknowledge security threats due to climate change and they have plans to reduce greenhouse gas emissions. I know that the Navy in particular has set significant greenhouse gas reduction goals. The Quadrennial Defense Review has a section that fleshes out the DoD analysis of the issue. This report also mentions reducing greenhouse gas emissions in support of U.S. climate change initiatives. See pages 84 through 88. Would the AAAS also be another scientific body with an agenda? Here is a statement that seems to indicate AGW is a real phenomenon. The fingerprint is still not discernible. And when he said it, human CO2 emission of that time is not now considered measurable or meaningful. So the experts have been proven correct and the idiot has later proven himself wrong. Heck if I know – perhaps I fell for an urban legend. I do know that what they are saying sure seems to fit what I’ve been hearing, but I’ve zero expertise when it comes to sound mixing, etc. so maybe there are other reasons. I do have a bit of tinnitus even tho only middle aged – but test a slight bit above average for my age on hearing tests, so I really do think that it has gotten much more difficult to hear the actors speaking in many TV shows – I assume that has something to do with how they’ve laid in the sound tracks or recorded the actors or both. If I recall correctly, many years ago (here in the USA) there was a fairly cheap device that would automatically mute all commercials – and it worked based on the fact that almost inevitably the commercials were significantly louder than the TV programs. Once those had been around for awhile or because of complaints or something, the commercial volume was reduced and the devices no longer worked – I assume that put whoever was making them out of business or they moved into something else. Now, years later, commercial volume has crept back up again to the point of being really irritating. Anyhow, the initial post just made me immediately think of issues that have been irking me with some TV productions – and with music. All interesting, but a bit beside the point: Anthony and his helpers do a fabulous job in bringing us this site and information – as others have said, my day wouldn’t be the same without it. I very much appreciate Anthony and everyone else who helps make the site work – and always remember that they are doing so not because it’s their paid job, but the best of motives – to help folks better understand an issue that has such a massive impact on us all ($$$, time, etc) and provide interesting scientific information. I was just hoping to perhaps have a small positive effect and sooth a little of the upset or ease any more that might occur by noting some of the legitimate issues that might be on the other side of the coin in case others posted similar comments about volume. So would the Department of Defense have an agenda too? … The Quadrennial Defense Review has a section that fleshes out the DoD analysis of the issue. Otter, ask yourself: Who do these departments report to? Does that person, e.g., their boss and his administration, have an agenda? The DoD commissioned climate reports during the last administration as well. For the Obama administration, is there any evidence such as a whistle blower from inside the DoD indicating undue political pressure was used to force those DoD report sections to be created or edited? What about the former administration’s Climate Action Report in response to the UNFCCC back in 2002? The first chapter lays out a balanced yet clear statement from the National Research Council that rise in mean global temperatures is likely due to human emissions. Was their a political agenda going on here too? Otter asks if the AAAS has an agenda. Frankly, all one has to do is read some of the other ‘policy statements’ they’ve released and, if one is at least somewhat aware of both sides of the involved issues, it’s pretty darned clear that at least the board of the AAAS DOES have an agenda. Those statements from the AAAS conclude with the agenda-less idea that things such as death threats, harassment, frivolous lawsuits, and politics shouldn’t have a bearing on science. The AAAS has a large membership of scientists, likely with a variety of views. Is there any evidence that large portions of the membership are up in arms against the board’s agenda or incompetence? Does the entire membership have some sort of bias? I love this competition between climate models, not how well they represent reality. If climate models are falsifiable then they are false because they do not get everything right. He put two measures (and their varibility). Preciptation- god no it totally kills everything. You have to get everything right for a chaotic system. I wish to thank Dr Santer for debunking the hypothesis that a high climate sensitivity is required to explain the ice ages and interglacials. Now we have it on his authority that it’s the Milankovic etc cycles which control these events rather than CO2, and therefore climate sensitivity doesn’t have to be high. When did he say that? He answered a question at time 1:14:15 where he had a slide that said “Myth #1: Atmospheric CO2 levels lag temperature levels, so CO2 is not an important greenhouse gas”. He goes on to explain how the Milankovic cycles tip off changes in the patterns where sunlight hits the Earth, which tips off changes in the carbon cycle, which amplifies the warming. His explanation is in line with statements made in numerous peer-reviewed literature, (Caillon, et al 2003 comes to mind, published in Science). Dr. Santer mentioned several times throughout the presentation that his group at Livermore rigorously tests models against past data (paleo data included) and short term forecasts. He even mentions that some of the early models did a good job with their long term future projections. His entire job is to evaluate models against reality. He made mention that there is relative and absolute comparisons for models. He mentioned that the short term weather models used for forecasting are also averaged over many models such that the best results are found. Weathermen base their 5-day forecasts and other predictions off of models. You don’t necessarily have to represent every little detail in the system, but evaluate the major drivers and be capable of determining the trends. Dr. Santer explained this stuff throughout, but he focused a concise explanation starting at around 28 minutes into the video. Every organization has an agenda or they would not exist. The ones that make claims about climate are the ones that have a vested interest in the outcome of the climate debate and they will make claims based on their agenda. They are all biased towards what is best for their “Agenda”. Weather men do not do a very good job of forecasting 5 days out, but sometimes the weather does what they claim and the results are equal to chance! Organizations such as the AAAS and DoD have a purpose to observe the science and make statements or defense plans accordingly. The NAS purpose is to provide an unbiased evaluation of the science for purposes of informing the public and the US government. Other National Academies throughout the world do much the same. Read a bit about the National Academy’s long history and reputation. Do you have a specific piece of evidence that the NAS, or these other organizations, are somehow compromised or biased? If weathermen were only able to do just as well as chance, why would anyone pay them to do 5-day forecasts? Do you have evidence to show that the average 5-day forecast is only as good as a random guess? I suggest looking into how weather models are used and their scientific backing. The book “Weather of the Future” by Dr. Heidi Cullen explains the history of weather models and their capabilities today in Chapter 3, quite an interesting book thus far, highly recommended. Also, this Wikipedia article has a section on models. Well said Otter17. You have effectively responded to correspondents. However, I suspect that many will reject your calm and rational approach. Nevertheless, please continue to communicate in this appropriate fashion. I am 52 minutes in and so far this is pretty typical of the arguments made at public presentations, and with the same flaws and addressing of strawman arguments. Since the main scientific issue in dispute is whether the net feedback to CO2 forcing is positive or negative. The CO2 signature argument is irrelevant, that signature should be expected even if CO2 is only responsible for 30% of the recent warming as expected from the direct effects, and would probably even be present with net negative feedback. And speak of fingerprints or signatures, for purposes of attribution, climate models should also get other fingerprints right. Camp and Tung, and separately Lean, et al, found that the models had problems representing the signature of the solar cycle. Santer mentions “four main feedbacks”: water vapor, clouds, snow and sea ice. Hmmm, precipitation-latent heat flux, convection, polar heat transport, etc. Just about all the rest of the climate system is negative feedbacks, including arguably the clouds he mentions. Temperature itself is negative feedback to the forcing, increasing the radiation into space. He goes on to discuss the snow diagnostic work of Hall from 2006. Andreas Roesch published the surface albedo feedback diagnostics in time for the Fouth Assessment Report. All of the models had problems with the earlier spring snow melts and snow cover extent. This correlated bias averaged more than 3 W/m^2 squared. Santer can wax all he wants about how wonderful the models are, that still doesn’t mean they have demonstrated skill at the 0.1W/m^2 level probably necessary for meaningful attribution of this small 0.8W/m^2 energy imbalance. Santer talks about model uncertainties, over the AR4 chart of model scenerio projections. But that isn’t uncertainty in the sense that most scientifically literate people would expect. As someone involved in model diagnostics, how can Santer not mention the key fact that those projections don’t include any adjustment for the uncertainties added by the correlated model diagnostic issues that are larger than the phenomenon of interest. Like other presenters I have heard, Santer makes much of model ensembles and averages, although at least he claims it is a mystery why the averages seem to do better. Perhaps he isn’t willing to go out on a limb, because he knows the even if the model errors are random instead of systematically correlated, there aren’t supporting mathematical arguments for assuming they cancel in a nonlinear rather than linear system. Santer also makes the correlation argument against solar, since solar hasn’t increased in the last 30 years, well CO2 didn’t decrease during the mid-century cooling either, and with its logarthmic effect. CO2 can do no better and explaining the steep rise in temperature. Santer also doesn’t discuss the significant disagreement among the models in sensitivity which has been attributed to how they handle aerosol uncertainty. By being careful to group human and natural causes separately, just like the IPCC did, he avoids the obvious possibility that aerosol uncertainty that could allow models ranging from 2 to 6 degrees C in sensitivity to “match” the 20th century climate, that same aerosol uncertaintly might well allow solar and the PDO to match the 20th century climate and recent warming. The aerosols might be able to match the 20th century climate and warming all on their own, if someone gave it a real try. At 52 minutes, Santer states that he is about to address the credibility of climate science. I won’t view that until later, but I suspect, he won’t be mentioning how model based drought fearmongering gets past peer review, without at least discussing the model diagnostic issues with precipitation, starting with Wentz’s publication in the journal Science, noting that none of the models represent more than one-third to one-half the increase in precipitation seen in the observations associated with the recent warming. Thanks much. I think most folks respond to calm and rational. I just don’t want to see comments that paint folks such as myself as an agenda-driven, biased weirdo, but as a guy that values good sources. I do love good sources, haha. I hope that Joe Bastardi and others in these comments reconsider the position that many folks accepting the evidence for AGW are agenda driven. I’m just a guy who likes science and engineering. Oh, and watch the video with Dr. Santer. Again, it is a really well put together set of slides and he has some decent public speaking chops. Can either of these two statements be traced back to the peer reviewed literature or IPCC? And this all begs the question, if CO2 isn’t a driver of this recent warming, what is? No, he doesn’t say anything about CO2 amplifying the warming – in fact, he seems very careful to avoid saying that. One of the big problems in this whole debate is the Team’s asymmetric response to real-world information. If some informational data, e.g. relatively cooling stratosphere temperatures, are supportive of the AGW/CAGW worldview, then the numbers are accepted without question. On the other hand, if the data from the satellites and balloons show no relative warming of the tropical troposhere (in violation of the AGW hypothesis), then we get half a dozen pal-reviewed papers along the lines of “it doesn’t matter” or “here’s a fancy indirect approach that shows it is warming really”. This is exactly what happened with the Allen 2008 paper which essentially said “forget the observations, the indirect wind-temperature gradient relationship suggests theoretical warming therefore that is what we should use”. I am quite confident in asserting that had both the stratosphere and tropical troposphere temperatures showed warming at the same rate, the climate litchurchur would have no shortage of papers containing the smart side-steps necessary to ensure that the stratosphere warming isn’t real, but that the tropical troposphere is “consistent with the models” – no further investigation required. Incidentally, what they mean by “consistent with” is a bunch of scattergun outputs showing such a wide spread of warmings that it would be virtually impossible for the real-world temperatures to fall outside the two standard deviation range of these fantasies. While we’re on the subject of Santer, it has to be recalled that in 2008 he tried to get away with dismissing the inconvenient tropical troposphere data by publishing a paper using old data. He was called on that cynical trick very nicely by McIntyre, McKitrick and Herman using up to date data. “No, he doesn’t say anything about CO2 amplifying the warming – in fact, he seems very careful to avoid saying that. Hmmm, then why did he mention that CO2 is the “leading dancer” during the current ramp up in warming? I suppose I’ll have to listen again, but that is the explanation I have heard from Dr. Richard Alley and in papers such as (Caillon, et al, 2003). I wouldn’t think Dr. Santer would disagree with such a well-established theory in the peer reviewed science. The whole tropospheric hotspot thing is as I understand it a thorny issue at the moment due to various measurement errors and getting different measuring devices to line up (satellites and weather balloons and whatnot). I’m not too sure on that one, so don’t take my word for it. Nevertheless, I have seen a Real Climate post that pretty convincingly showed that the tropospheric hotspot that is supposed to develop during a period of warming is caused by what was called the lapse rate (heat rising up into the atmosphere). Thus, it doesn’t matter if the world warmed by increased solar input or increased greenhouse blanket, that hotspot would be expected to show up in any warming scenario. The problem is a practical one in measuring that hotspot, but not a terrible problem since it isn’t needed for fingerprinting necessarily. The stratospheric cooling fingerprint has been seen, and that is the only fingerprint needed to demonstrate the greenhouse effect. Well, that doesn’t seem very fair. You are essentially accusing scientists of biased practices or malfeasance even under a hypothetical situation. It seems that no matter what situation they are presented with, if the conclusion comes out as greenhouse warming, they are biased. Try not to project your own potential bias against the greenhouse effect against these scientists. Not saying you are biased, just be careful since we all get carried away sometimes. I say it makes more sense that the troposphere hotspot is a measurement quirk that they are trying to work out. It makes more sense that Dr. Santer (whose job it is to rigorously test these models) wouldn’t screw up something like this fingerprint issue. Why don’t you send your question and graph directly to Dr. Santer? So, it’s now definitely confirmed that we are no longer in the LIA. What a relief! Thanks to all the weather and climate gods. Is your repeating of the official word not driven by your own acceptance of an agenda? Why is it that no one can actually give a definition of greenhouse warming that uses quantifiable properties to predict the effect? I note noone pulled up Santer on his initial statement that models are falsifiable so where is your falsification standards which you can’t fix by fiddling a few parameters (internal statements- not some post processing assessment ) that which if your model fails that then its invalid. Also 90% confidence is worth about vague link- no other science would accept such a weak link. I’m not sure where I am repeating any one given point. Looking back at my previous comments, I provided a variety of sources, and helped clarify a few things from the Dr. Santer presentation. Also, I was clarified in my hearing comprehension for a portion of the lecture by Peter. Why would I necessarily have an agenda if I understand several different sources and see that they are consistently in line with peer-reviewed science (from what I can tell)? What do you think my agenda is and why? I appreciate the honesty, but when accusing someone of having an agenda it is nice to have a reason why or some evidence to show. As far as the definition and quantification of the greenhouse effect, I believe that particular portion of the science has been fairly well established since the 1800’s with the work of Fourier, Tyndall, and Arrhenius. Take a read from this Wikipedia page for more background. Also, as I understand it, there is a way to quantify the greenhouse effect via a phenomenon known as “radiative forcing” with units of W/m^2. It represents the energy rate for a given unit of area. Check out Figure 1 and Figure 2 from this paper. Note that the greenhouse gas radiative forcing is around 3 W/m^2 with some fairly small error bars, so the quantity is known pretty precisely. Figure 2 comes from the IPCC 2007 report and contains a narrow greenhouse gas forcing probability distribution curve, also showing that the radiative forcing for the greenhouse effect is pretty well known. I’ve completed my viewing of the video. Santer glosses over the embarrassment to science that the East Anglia email revelations represent. I was surprised to find that he questions that the CO2 radiative influence is logarithmic, I doubt he would do that without some evidence, does anyone know what literature cite he might be relying upon? I understand the “wings” argument, but has any investigation quantified that in a credible way? Is Santer questioning the level of CO2 forcing claimed by the IPCC? Otter17, Why must the warming have just “the” driver? If CO2 is only 30% or so of the recent warming, there are plenty of other candidates that can share the “driving”, the positive phases of multidecadal ocean climate modes like the PDO, increases in anthropogenic black carbon, decreases in the anthropogenic cooling aerosols, climate commitment from solar remaining at a grand maximum plateau through the remainder of the 20th century, oceans returning to “normal” after the little ice age. This “Physical Review Letters” study on neutrino oscillation data indicates a 90% confidence level in the abstract. Correct me if I am interpreting this incorrectly. I did a Google Scholar search and found other abstracts that mentioned 90% confidence level as well. I am not a statistics guru, but I understand that 90% and 95% are two standard confidence intervals used. Aside from that, as a layman, isn’t 90% confidence level good enough for making decisions on the science? It is highly unlikely we can ever have 99.9%. Oops, forgot the link to the previous comment concerning the “Physical Review Letters” paper on neutrinos. Actually, he addressed the issue directly, mentioning that he was affected/involved and also mentioning the six investigations into the matter. He also makes mention of how the incident doesn’t affect IPCC and NAS statements concerning human’s major contributor to global warming. He talks about it for a minute or so, what would you rather he have said? Have you read some of the reports/material from the investigations into the incident? As I understand his response to Anthony’s question, he doesn’t deny a logarithmic effect, only that it is not near saturating, even at very high concentrations such as 1000ppm. Table 1 in the paper linked below gives an equation for CO2 radiative forcing as CO2 concentrations increase. Also, you could take a look at the Ray Pierrehumbert reference that Dr. Santer gives in the presentation. I believe Dr. Gilbert Plass studied the “wings” effect of the CO2 band as far back as the 1950’s. Sorry if my comments prior may have caused some confusion in that regard, but the evidence shows that there are indeed multiple drivers, the values of the forcings are illustrated in Figure 1 in the link below. Others in the comments above have mentioned what they believed to be sole drivers of climate, such as the PDO for one person and the sun (with chaotic weather feedbacks) for another person, if I have paraphrased them correctly. I do not believe they are correct based on the peer-reviewed evidence I have seen. To me, your comment seems to be the most correct. I recently attended a talk by Dr. Gutzler of the U of New Mexico that was very similar to Santer’s and he gave a similar exoneration of the East Anglia revelations citing the various investigations. But when pressed on the attempts to frustrate FOI requests, to pressure editors not to publish skeptical papers and to hide a failure of the proxy data to track temperature, he admitted that we would not find anything like that should his correspondence be made public. He doesn’t act less honorably in private than in public. Well, being honorable in every single one of your private correspondences is nice and all, but what really matters are a person’s actions in the public sphere. In the public sphere, the skeptical papers ended up in the IPCC 2007 report, so their correspondences to pressure editors did not come to fruition. Many of the FOI requests were deemed to be frivolous or of a nature that CRU could not respond to them. If the data that CRU held could not be released to a third party due to permissions, there was nothing that CRU could do for some FOI’s; the requesters needed to do their due diligence and ask the individual data holders themselves. Yes, agreed that CRU was ill-equipped in size of staff to deal with such a large amount of FOI’s. Again, in the public sphere, CRU did what they could for the FOI’s, albeit in a quite haphazard way. As far as hiding the failure of proxy data to track temperature, the investigations saw no fault with their peer reviewed papers, albeit the graphs shown in the IPCC report did not show the caveat. It is not fair to claim that CRU was involved in some malfeasance to cover up the proxy data if none of the investigation panels found them guilty of malfeasance (that I know of). Read the investigation reports before making claims of malfeasance about these scientists (or any scientist for that matter). If you have already read the investigations, and you are not claiming malfeasance, I apologize. I beseech you; read it if you haven’t already. Furthermore, if you believe that the incident had any bearing on the science within the major scientific communities, read these statements from AMS, AGU, AAAS, and NAS. “I’m just a guy who likes science and engineering”. That may be the most accurate statement from all your posts. Rather than liking engineering and science, I am an engineer and scientist. So if you want to learn something about climate models from a true expert, who I believe does not have an agenda, hop on over to Roger Pielke Sr.’s site. You may learn something. Regarding AGW, the science is not settled, not by a long shot, not even close. And science is not conducted by consensus. So if all these “scientific” organizations have hopped on the AGW bandwagon, well, it tells me their leadership does not know what the hell the scientific method is all about, and that they do have an agenda. I have been following WUWT for years and this is only my second post, because I didn’t feel that I would significantly add to the discussion, and I am just not in the same league as some of the highly talented and extremely educated persons who post on this site. You may want to consider this as well, and maybe go back to school and actually study engineering and science. Ok, cool that you are an engineer and scientist. What type of engineer and what type of scientist are you? What school did you attend? I am an electrical engineer working for an R&D unit at GE Energy. I have a master’s degree and pretty soon I will be able to sit for the P.E. exam. Anyway, enough chit chat, as far as Roger Pielke Sr.’s remarks on models, do you know if he has any other peer reviewed papers that make the criticisms of models that you quote in your comment? And if you believe he doesn’t have an agenda, that’s good enough for me. I don’t assume anybody has an agenda unless I see some evidence otherwise. I’ll have to do a search for (NRC, 2005), thanks. Wait, so you think that the National Academy of Sciences of has an agenda? This society has been around for a long time (Civil War when Lincoln commissioned it). Plus, if any of the membership realized that there was a biased agenda, they would leave in droves. I haven’t seen that happen. Try reading this joint statment in the link at the end of the paragraph. It contains sign off from national academies of Brazil, Canada, China, France, Germany, India, Italy, Japan, Russia, UK, and USA. Do you feel that all those national academies have an agenda? They all analyzed the large body of peer review scientific evidence and came to the conclusions in the statement. Tell you what, let’s both read this Wikipedia article. I have read much of it before, but it never hurts for a refresher, eh? Congressional Budget Office states that $99 Billion has gone into studying the climate. Naturally, the more alarmist someone is, the more likely the are to get payola. You can get up to speed by reading up on these serious problems while you’re recuperating. And then of course there’s this. I am an electrical engineer working for an R&D unit at GE Energy. Ah, so it would appear that your career is reliant upon GE’s green success. I have the emails, I don’t need investigations to tell me what to think. If they are corrupt in private, then what they do in public is a lie. If they grew up loving truth, they lost it someplace along the way. They aren’t scientists. Can someone please explain the process used to determine “satellite based estimated observations”? Is this some kind of adjustment to temperatures recorded? I hope I’m not the only one in the room who isn’t clear about this. I took an Earth View fly over of Brazil and other countries in South and Central America on googlemaps. Yes there are some roads and farms but most of all there are thousands of miles of rain forest and dense canopies. What was Dr. Santer implying about the Central Valley climate change as a result of irrigation? Was he referring to the less frequent hundred and teens for weeks at a time that we saw in the 50s? Did he notice that before dams, there was a huge lake (Tulare Lake)? Was he referring to Tule Fog? That’s been around forever and I’m not aware of any change. I heard the statement implying change but no explanation. Can anyone clarify? I’m sorry if I’m well behind the curve. Thanks for your help. Thank for providing the video. I also have hearing problems. I know how frustrating and confusing it can be, even with the best hearing aids available. Why was Dr. Santer so agressive when you asked your question? His body language is so clear. He might have ready answers but he could never play poker. This, in itself could be productive. His discomfort may make him and others think about what they are saying and how they are received. Dr Santer is especially scared when the Medieval Warm Period is mentioned and doesn’t even try to answer that part of the question. Obviously his model doesn’t work for that period or any other warming period so why does it work now? Smokey, you’re so unspeakably cynical. You imagine the whole scientific community is either corrupted by a drive to “get payola” or fulfill some sinister agenda, which you never clearly define. Isn’t it possible that the vast mainstream of scientists are simply trying to uncover the truth about vital natural processes and systems, and to describe their observations and conclusions. Sometimes their language is difficult for us (laymen) to understand, and we often have many questions, but getting the answers to these queries will always be skewed if we are deeply committed to an anti -science agenda. Not really, supplier to diverse markets. The company that I work for was recently acquired by GE. We deliver products and custom solutions for motors, generators, drives, and inverters for a variety of market segments. The market segments include mining, steel production, marine, fossil/nuke power generators, and renewables. I happen to be mostly in marine. I guess you have not read the investigation reports then? Reading the investigations does not tell you what to think necessarily. It only provides you with additional insight from experts that have looked at more information than just the emails themselves. You have to admit there is at least a small chance that you may have taken something out of context from the emails you read. Plus, one has to admit that 6 investigations provides a pretty solid case, not fool proof of course, but certainly solid. I believe the great scientist Richard Feynman would encourage you to read the investigations just to be sure your understanding is correct. I believe a guy by the name of Jesus said that “he that is without sin among you, let him first cast a stone…”. Everybody at some point in their lives has said something unsavory behind someone else’s back, yet acted nicely to the person’s face. Out of 1000 emails stolen, only a handful indicated this type of behavior. Cut them some slack. Now, that isn’t to say I agree with what was said, some stuff wasn’t nice. No, they ARE scientists. They have spent much time studying in school, conducting research, and publishing many peer review papers/results that have been confirmed by other researchers. They continue to have their jobs even after the incident. Dr. Santer says in the seminar that these are not his models. His job at Livermore Labs is to rigorously test all the world’s best climate models against past data, as well as do forecasting tests. Aside from that, do you have peer reviewed evidence to show that these models do not work for past warming periods? Do you have any documentation to support your claim of thousands of scientists asking for their names to be taken off the IPCC document? Thank you Otter17 for turning this into an interesting thread. as one who allows passions a tad too much sway you are an inspiration worth trying to emulate. While it may be difficult to speak with Smokey since he does behave in a somewhat antagonizing way, I would encourage you not to speak in an accusatory tone towards him. I would rephrase that as “Smokey, your thought process on this matter seems cynical”. I don’t want to tell you how to speak, of course. I only recommend that we all try to keep discussions as civil as possible, no matter how someone treats us or how cynical someone appears to be. I am not religious, but I do agree with that cool cat named Jesus when he said “if someone strikes you on the right cheek, turn to him the other also.” Heck, I have screwed up in this regard many times, but I try to do better each time. Yes, I would have to agree with citizenschallenge that this claim seems like it would need some direct evidence. “Thank you Otter17 for turning this into an interesting thread. Your comment made my day, citizenschallenge. Thank you. I would say that passions are what drive us to do great things, but they must at all times be kept in check by logic and reasoning. I just made that up, but I sound a little like Spock from Star Trek, hahaha. Your incessant mindless yammering, threadjacking, and playing kissy-face with your one or two equally pseudo-scientific numpties has not convinced one skeptic to change their minds and start running around screaming, “The sky is falling!” Why not? It’s because the putative ‘facts’ you post are not facts at all, but easily countered misinformation. Every argument you have made has been refuted. Don’t believe me? Post one of your alarmist talking points and I’ll deconstruct it. I’m still waiting for one of you jamokes to try and falsify my hypothesis that CO2 is globally harmless, and that a degree or so of warming is on balance beneficial. Instead, you avoid answering, and rant on with your silly, inane globaloney talking points that anyone with average common sense can easily debunk. Flattery will get you far. You are just another one who can’t go toe to toe using facts, logic, the null hypothesis, and the scientific method. And as Niccolo Machiavelli urged: beware of flatterers. Ok, try the greenhouse effect. Disprove the following description. I think that would be difficult, though, since scientists like Fourier, Tyndall, and Arrhenius did many experiments and a lot of theoretical work in the 1800’s. It has further been confirmed by measurements today that show an increased amount of infrared radiation being reflected back towards the ground. Oh, and you also mention the null hypothesis. I have heard many times that contrarians demand that the null hypothesis be proven, but there is no way for that to be done in many branches of science such as biology, psychology, medicine, etc. One can provide a substantial amount of evidence and statistically significant data, but never prove 100%. The science will continue to be evolving for many years, just like any other branch of science. Must the wheel be reinvented? The Wiki definition; “The greenhouse effect is a process by which thermal radiation from a planetary surface is absorbed by atmospheric greenhouse gases, and is re-radiated in all directions. Since part of this re-radiation is back towards the surface, energy is transferred to the surface and the lower atmosphere. As a result, the temperature there is higher than it would be if direct heating by solar radiation were the only warming mechanism.”, offers nothing quantifiable.. It has been over a hundred years since the Arrhenius hypothesis regarding the warming phenomenon of greenhouses was shown to be without merit. Do you have any understanding whatsoever regarding the physical process you advocate? What evidence is there that Arrhenius was shown to be wrong? I would like to see a peer reviewed paper, please. Oh, and we can quantify a greenhouse forcing in the units of W/m^2 (3 W/m^2 to be more precise). See my reply to you just after your first comment in this thread. I explained more up there and gave you a link to read. Anti-science couldn’t be further from the mark. That there are many who profess faith in the greenhouse gas hypothesis who have been recognized with praise and pay; is a travesty, and a black mark on the institutions that have fallen for it. Why go to past warming periods where the uncertainty in proxy data provide are less constraining? There is plenty of evidence that the models don’t work for the most recent warming period. For instance, Wentz’s publication in Science reporting that none of the models produce more than one third to one half the increase in precipitation observed in the recent warming. Or Andreas Roesch’s diagnostic subproject showing that all the AR4 models had a correlated positive surface albdeo bias vis’a’vis the observations during the part of the 90s he analyzed. Or Camp and Tung’s result that none of the models reproduced the amplitude of response to the solar cycle they detected in the observations. Lean found similar problems in the model responses to the solar cyle, although at about half the level of Camp and Tung. There were lots of diagnostic results available to the AR4 Working Group I authors, yet you will find no evidence that the IPCC range of projections include any adjustment for them. Andreas Roesch’s correlated error alone is the equivalent of over 3 W/m^2 globally and annual averaged. That is comparable to the CO2 forcing and about 4 times the size of the energy imbalance that we are attempting to attribute. With an energy imbalance of under 0.8 W/m^2, do you have any peer review evidence that the models are accurate to the approx 0.1W/m^2 necessary to get a rough approximation of the relative attribution? I’ve commmented many times that radiative physics regarding the so-called ‘greenhouse effect’ make sense to me, but that it has only a very minor effect. What is ridiculous is the matter of degree claimed. The planet has warmed over the past 150 years, from ≈288K to ≈288.8K. That is truly minuscule, and debunks the wild-eyed notion that more CO2 will cause climate disruption. So that CAGW talking point is deconstructed. And the null hyporhesis can be very easily falsified. Simply provide evidence showing that the parameters of the Holocene have been exceeded. Since there is no such testable evidence, the null hypothesis remains unfalsified. So that alarmist claim is also deconstructed. Got more of your CAGW beliefs that need deconstructing? Bring ’em on and I’ll help further your education. Simply amazing! Deconstruct the thousands of peer-reviewed papers that went into the IPCC and you’ll be the savior of all the world. Well unless there is a conspiracy by all the distinguished scientific bodies in the world to suppress the truth in spite of the major energy companies spending tens of millions of dollars every year to get it out. A greenhouse works by trapping air, not IR. Professor Woods demonstrated this in 1909. For what it’s worth, someone was asking if anyone would take the time to transcribe Santer’s talk at Chico State. Well, I have. It’s not the full hour talk, only about 4,000 words worth of highlights with time signatures. PS. Anthony if you cared to offer me Donna Laframboise’s new expose I’d promise to read it? Anthony, I was just asking. I do appreciate your courtesy in not deleting my above post and link. And I’m sorry that my feelings towards the posts and comments here is so dismal, but, that’s why I’ve started that site to intelligently explain why I feel as I do. Unfortunately, I’m a worker-bee so my time is limited, but I will keep plugging away at it as my free time permits. much more effect than CO2 on earths temperature.